A simple lunch salad recipe highlighting seasonal cherries and peaches along with pistachios, sugar snap peas and a rather special fat-free and fruity dressing. Add crumbles of goat’s cheese or cashew ricotta for a yummy, creamy tang. 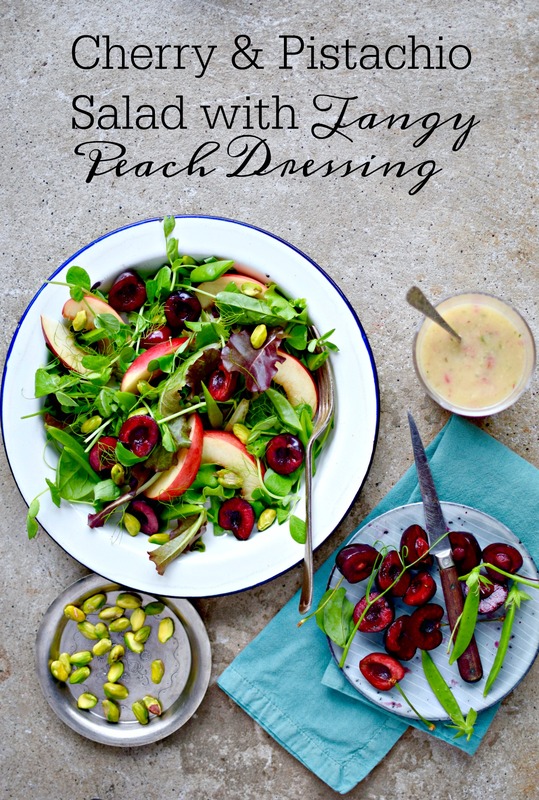 Before the stone fruits season completely leaves us, I thought I would just nip in quickly to post a simple and elegant salad recipe that highlights two summer faves – cherries and peaches. As with most fruits at their succulent best, devoured whilst in a bath – or by the kitchen sink if you are boring – is the way to go. But when I am jaded by yet another juicy, sunset-stained peach or paper bag full of shiny crimson cherries, I almost always pop them in a salad. And even make dressing from them. This last way with fruit is a great way to use slightly “over” specimens, or even ones that have taken a tumble off the countertop. Oops! The peach dressing I make week in and week out during their season, blitzing the peaches, skin on, with a little apple cider vinegar, some Dijon mustard and a little seasoning and water. No oil; it doesn’t need it to get that unctuous texture that all good dressings have, but add some fruity extra virgin olive oil if you wish. The taste of this dressing is so utterly fantastic that I’m sure you will make variations of it with other seasonal fruits – strawberry is lovely, as is raspberry. I made a peach and raspberry version for this White Nectarine and Pecan Salad. To make this light but balanced salad even more satisfying, top with little nuggets of best goat’s cheese or cashew ricotta. And serve with hunks of fresh, crusty bread or – my favourite – these crispy fennel seed flatbread crackers. Fennel Seed Crackers – so easy and so good! I will be back later in the week with a special photo-heavy post on my utterly heavenly trip exploring the windswept and wildly beautiful Scottish Outer Hebrides. If you follow me on Instagram, Facebook or Twitter you might have caught some of my over-awed posts and Instagram Stories on this scenic string of islands. I really did fall in love. Although the weather was unusually mild and sunny, even in a more typical gale, punctuated by nails of rain dashing down, I think I would still be pretty smitten. 1. To make the salad, slice the peach into thinnish segments; stone the cherries either with a de-stoner or with a small paring knife and halve; slice the sugar snap peas on the diagonal, and rub the skins from the pistachios if they are present. I soak the pistachios in hot water for a few minutes to make the skins slip off more easily. Pop the pea shoots into a wide serving bowl or over two plates and top with all of the salad bits, tearing in the fennel fronds, tarragon and mint. Add the cheese if using. 2. For the dressing, add the chopped peach to a small food processor bowl/mini chopper, along with the mustard, chopped tarragon, vinegar and a pinch each of salt and pepper. Blitz until smooth, adding a dribble of water to make a thick but pourable dressing. Spoon the dressing over the salad. Serve with crusty bread or these crispy fennel seed flatbreads. Thank you so much, Irene. Blueberries would be nice here too. This looks just perfect for summer, wonderful pictures too! Ooh looks totally mouthwatering, I love all these ingredients and the thought of those juicy cherries with the feta, oh yes! Lovely dressing too. Thanks for your warning about the next post, I might have to look away otherwise I might just have to run and catch that Cal Mac ferry over to the islands! This salad is so vibrant…. The peach dressing finishes it off. Will be nice to try. The photos are so amazing, everything looks so fresh and tasty! Looks amazing! Cannot Wait To Try! I will do! Thanks so much for the comment back! The colors pop up so beautifully! The cherries and pistachios go so well together! I should search for something I don’t like about this recipe. Beautiful!